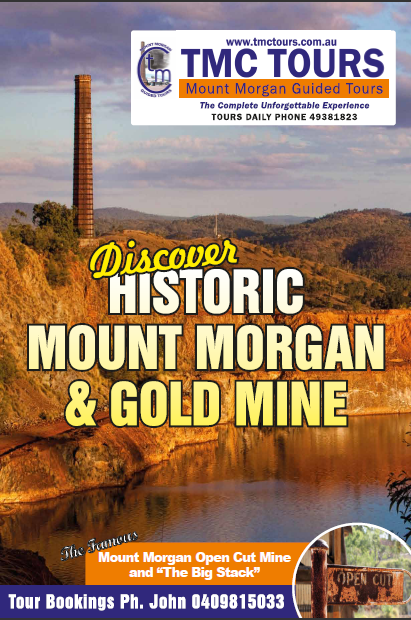 TMC TOURS WILL BE CONDUCTING SHORTENED MINE TOURS (1.5hrs) ON SATURDAY 5th MAY, 2012. DURING THE GOLDEN MOUNT FESTIVAL. TOURS DEPART MORGAN STREET, NEXT TO THE HISTORICAL MUSEUM. PLEASE PHONE JOHN 49381823 FOR TOUR DETAILS AND BOOKINGS. FOR THE REST OF THE GOLDEN MOUNT FESTIVAL LONG WEEKEND, TOUR TIMES ARE AS PER USUAL. SUNDAY 6th & MONDAY 7th MAY- 10:30am & 1pm. BOOKINGS REQUIRED. 2hrs TOUR DURATION. WE HOPE TO SEE YOU AT THE GOLDEN MOUNT FESTIVAL! TMC TOURS regrets to advise you that access to the Fireclay Caverns (dinosaur footprints) is closed until further notice. Dinosaur imprints and many fossils can still be seen within the Fossil display as part of the TMC TOUR in the Mine General Office.